The complex goal of setting CO2 targets for this sector is extremely ambitious but also necessary, as Green House Gas – GHG - emissions from the sector have grown by 19% from 1990 to 2015 and they are expected to increase by 6% till 2030 under a business as usual approach. At the same time, it is fundamental to consider the specific priorities of the sector, where fuel cost represents approximately 30% of the operating costs and most of the operators are composed by small and medium enterprises. Over the Total Cost of Ownership – TCO – and the environmental performance, load capacity, vehicle range, reliability and durability of the technologies are fundamental parameters. It is clear that according to the multiple missions the HD sector is asked to fulfil, no unique solution can fit and the mechanism to assess the different technologies, both available today or under development, will need to rely on a methodology that guarantees the so called “technology neutrality”. In parallel, it is also evident that the curb of GHG emissions is the result from a composition of efforts merging together different contributions, not only related to engine/vehicle technologies but also, for instance, to the traffic management, to the optimization of the logistic operations, that can both be supported by an increasing digitalisation, going to the training of the drivers. Integrated approach will have also to be considered as background condition. Natural gas is used in the HD sector since few decades: vehicle technologies are mature, affordable, safe and ready to provide a fast and strong contribution to the transportation challenge. Natural Gas represents itself a “family” of fuels, from CNG (Compressed Natural Gas) to LNG (Liquid Natural Gas), including all the corresponding bio and synthetic options, that can be easily blended to natural gas or directly used on the vehicles. From typical urban applications on bus and refuse collect trucks, today the market is fast growing also in the domain of the long haul transport thanks to LNG. Only in the last month three new LNG trucks products have been launched on the market, all with performance and range (up to 1500 km) equivalent to conventional diesel ones. On top of the continuous engines and powertrains technological evolution, the use of natural gas results in an immediate reduction of CO2 tailpipe emissions, up to 15% compared to Diesel, thanks to the combination of an high efficient engine and the fuel properties, as Low Carbon fuel. Current ongoing developments on natural gas engine technologies (cfr EU H2020 projects “GASON” and “HDGAS”) are demonstrating the potential to develop for post 2020 high efficient engines with Diesel-like efficiency capable to take the maximum profit for the fuel characteristics, considering specifically the development of new Direct Injection systems. Nevertheless, CO2 emissions have to be also assessed looking to the in-use emissions in order to include also the contribution from the fuel production and distribution. This results fundamental in the case of alternative fuels and/or energy carriers where GHG emissions from the production process and distribution can dramatically influence the overall result in terms of real decarbonisation. 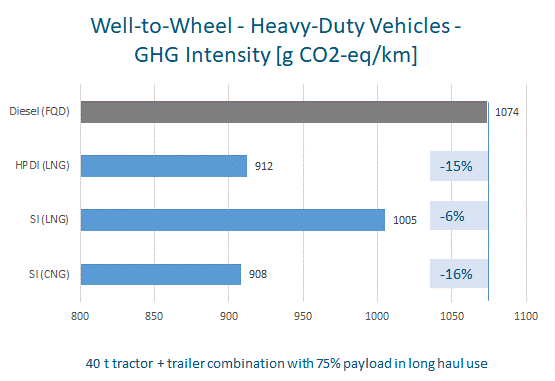 Figure 1 shows the result from a recent study on the GHG footprint from the natural gas used as transport fuel ; results show a benefit in terms of GHG Well-to-Wheel reduction up to 16% compared to Diesel. It is also important that the analysis has considered all the GHG emission sources, including CH4 and N2O, on both Well-to-Tank and Tank-to-Wheel side. 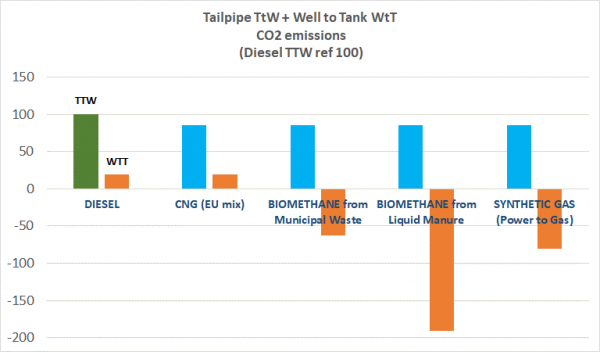 But figures change dramatically when considering biomethane and synthetic methane: from the so called Well to Wheel perspective, reductions vs Diesel and conventional natural gas are as shown in Figure 2, where both contributions are represented. 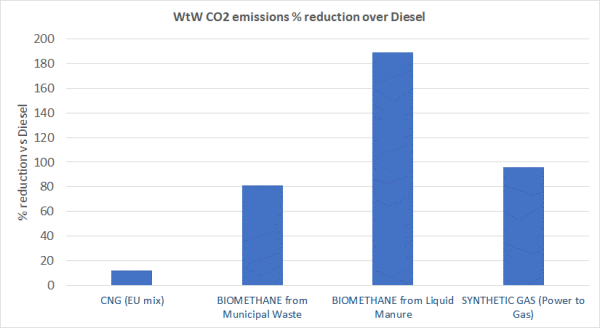 Figure 3 shows an important benefit related to municipal waste conversion and Synthetic Gas delivering CO2 reduction rates in the range from 80% to 95% compared to Diesel. Looking to biomethane production from liquid manure residues, the methane capturing effect provide even an overall negative balance, indicating that the conversion from waste to energy provide much benefit on GHG emissions as a high amount of methane is captured from the manure avoiding its effect in the atmosphere. In all conditions, carbon neutrality running with renewable gas can be achieved, already today, as natural gas vehicles are ready to run full renewable. Over the GHG performance, Natural Gas is the cleanest fuel able to guarantee all over the operating conditions the lowest particulates level, aromatic free and near-to-zero NMHC (Non Methanic Hydrocarbons) as well as dramatically reduced NOx emissions. For these reasons both regulated and non-regulated emissions (e.g. ozone promoters, PAH) make Natural Gas the right fuel to quickly answer to the air quality issues, particularly in the urban areas. Combustion is particularly silent and, compared to Diesel, noise emissions are cut by two, providing a perfect solution also for overnight operations and increasing vehicle comfort. Natural gas is also a perfect fuel for preserving the environment in the Low Emission Zones. For the reasons above explained a technology neutral approach is to be pursued, where the focal element is the result from the technology and not the technology itself. In parallel to the measurement of the tailpipe CO2 emissions, which are necessary as indicator of the vehicle efficiency and also to provide the indication of the fuel consumption, emissions associated to the fuel provision should be considered looking to the much wider decarbonisation target. Calculation methodologies (e.g. CO2 credits/bonus) should be implemented in addition to tailpipe CO2 emissions to reward technologies such as renewable gas that, already today, can sustain a carbon neutral transport system. Certification of the renewable gas quantity traded to the transport sector can be easily implemented at Member State level. Moreover, especially in the HD sector, several fleets of trucks and urban bus are, already today, fed 100% with renewable gas. With natural gas carbon neutrality is already a close reality !